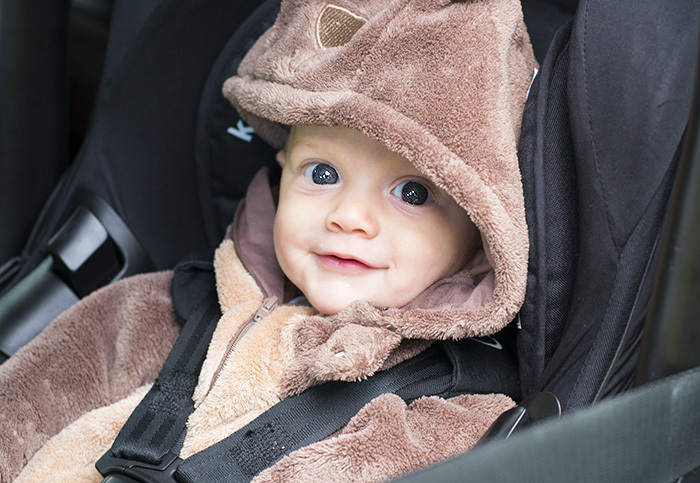 We were recently sent a Kiddy car seat to review, it’s the Evolution Pro and has some pretty awesome features. One of which is that when you lay the handle back it extends the seat making it safer and more comfortable for sleeping babies. If you look at the above photo, then the one below you can see how it extends out. We have been putting it to the test for the last couple of months and have been really impressed. One of the things I like is the large range of colours it comes in, I originally went for the turquoise but it was out of stock due to it being so popular so I then considered the white (which has a zebra print on the inside) but then decided on black to match the colour of our Click ‘N Move. You can get adapters which mean you can attach this Kiddy car seat to the pushchair. The Kiddy car seat also comes with accessories, we were sent a raincover / mosquito net which pops up like the foldaway tents you can get, when folded up it fits into a little bag. It has two layers, one to stop insects and one for when it rains. It also has reflective components which make the seat visible in poor light. We were also sent one of the UV parasols which have a sun protection factor of +80. It can clip to the Evolution Pro as well as many other strollers. The seat comes with a newborn insert and you can also get a premature baby insert for very small babies. The seat is suitable for babies until they are around 15 months old and has five different strap placements on the back which you can adjust as they get older. I was really impressed by how padded and comfortable the Kiddy car seat was, it is so different from the one we were using before. It rocks which is always a useful feature for young babies. It is a lot heavier that the one we were using before but I just assume that is a good thing as it makes it feel a lot safer and sturdier. One thing I do always have to make sure is that the handle is up when driving as you can only have it reclined when it’s not in the car. I don’t always take it out of the car and when I put Tiger in I have to put it down so it took me a little while to make sure I was always putting it back up but it does come naturally now. I really wish these had been available when Cherry was a baby as she only sat in the car seat attachment of her pushchair and used to spend hours sleeping in it, Tiger isn’t so much of a sleep in the car / pushchair baby (he likes to be in the Ergo all the time) so probably doesn’t get as much use out of it’s features as Cherry would have done but I can honestly say that I would have chosen this car seat when it came to purchasing one had I known about it. 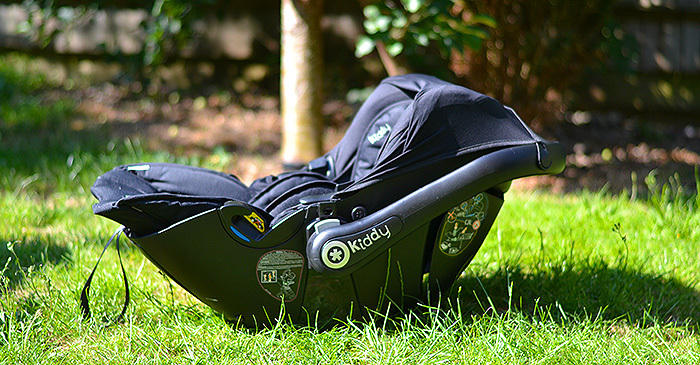 Obviously safety is a big thing to consider when choosing a car seat for your child and you can read all about Kiddy’s safety standards and watch crash tests here – Kiddy Car Seat Safety. Here is Tiger sitting happily in it. Anyone who follows me on Twitter will know about his tendency to scream in the car at the moment but I can honestly say that as long as we drive in the morning then he sits happily in this, in our previous one he used to cry no matter what time of day it was! Disclaimer: We were sent this product free of charge for the purpose of this review but all of the words and opinions are my own.